With high sunspot numbers for the first time in eight years, the 2011 CQ WW CW Contest lived up to the hype, as wide open high bands brought huge numbers of contacts on 10 meters, drawing in hundreds of serious ham radio contesters and thousands of other hams searching for DX from around the world. "What a difference from last year," said Mitch Mason K7RL, who found 40 meters to be the best band from his QTH in Washington State. "10m and 15m were better to EU in the SSB version, but 40m was absolutely outstanding," said Mason, who made 1,000 contacts on 40, and added 361 on 10 meters. "I have never heard it that good." Those sentiments were shared the world over. "Things really have changed since I left in August for college," wrote Michael Almeter W4MJA on 3830. "We now have sunspots and band conditions are really good!" "This was my first venture into CW contesting," said Roland Spoon AH6RR, who managed to find 32 zones in a 10 meter single band entry from Hawaii. "I had a blast and did a heck of a lot better than I thought I would." You could tell how popular 10 meters was this year by the number of 3830 postings before the contest was even over from Europeans who did 10 meters only entries, as they joined in hailing the good contest conditions. It was yet another reminder that the saying is very true - "There's no meters like 10 meters." "I think it was a wise decision to go for SOSB 10m," said OP4K, who had 1584-38-143 for 625k. "Thank you all and thank you for the sun spots," said Doug EI2CN who had 619k on 10 meters. And the stories go on and on and on about 10 meters, stirring up higher than expected totals for the little guys with no beams and the big shots with lots of them. "We had a great time," said Frank Donovan W3LPL, whose Multi-Multi team shattered the US record, but still didn't finish first in their category in the USA. "Fabulous conditions except for a little on Saturday night," Donovan said on the real 3830 just minutes after the contest ended. The Multi-Multi win in the US will likely go to Team KC1XX, which claimed 35.4 million points; Team K3LR was at 34.4 million, just ahead of W3LPL's 34.3 million. All three of those scores crushed the USA Multi-Multi record - set just last year by W3LPL - of 25.6 million, as all three teams made over 11,000 contacts. Also likely shattering a USA record was Chas Fulp K3WW, who claimed 10.7 million points in the High Power Assisted category, more than two million points above his USA record set just last year. 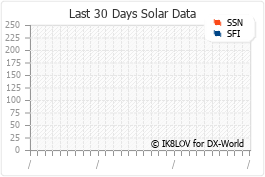 While the high bands were very active thanks to solar activity, a minor solar storm caused some troubles early on Sunday morning GMT, knocking down signals on low bands like 80 meters, where you could hear contesters with major antenna farms in North America struggling to contact loud stations in Europe and Africa. "Band noise dropped 15-20dB and all but North America disappeared with the exception of a few Central American stations and limited South America," wrote Robert Kile W7RH about what he heard. "Everything worked to perfection," said Paul Newberry N4PN, "except maybe the conditions Saturday night." "The 2nd night was terrible to EU," wrote Gary Schwartz K9GS on 3830, who said he "wasn't able to work EU until after 0200Z," though he called conditions to Asia "fantastic." "SS (sunset) at the end of the contest was also bad," Schwartz added, "didn't work a single station."